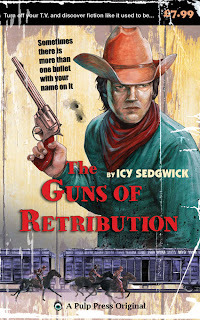 Here I am with my final post about The Guns of Retribution, ahead of its paperback release on Saturday. When I asked for questions, John Wiswell asked "if writing it has taught you something, that'd be good to share." Well, you know something? Writing it DID change something for me. I've already touched on my writing process a tad, but I thought I would expand slightly on how I stopped being a pantser, and started looking at plotting instead. Pants vs plot seems to be the kind of either/or debate that just won't go away. It's like choosing between the Beatles and the Rolling Stones, between Macs and PCs, or between pirates and ninjas. A while back, I would have said there was no way you could ever find any middle ground - you're either one, or the other. The Guns of Retribution changed that. Pre-Guns, I was very much a pantser. When I wrote the first draft of my Fowlis Westerby novel, I made it up as I went along. I vaguely had the ending in mind, but there was no definite sense of a plan. Characters spouted dialogue and made decisions on the spur of the moment, and it was all very exciting. The First Tale was much the same - considering it was a web serial, I didn't really know where it was going until episode fifteen. Then Grey O'Donnell breezed into my life and made me think about things differently. I began his story and suddenly I had a bulletpoint list of plot points I wanted to include. I knew the beginning, middle and end, and while I didn't have a detailed synopsis, I knew enough to make up the bits in between. I always thought plotting seemed too regimented, or rigid. How could you have fun following your characters' carefree flights of fancy if you already knew what they'd do next? It seemed a little too much "writing by numbers" and I worried that plotting in advance would leave the resulting story feeling a little formulaic. On the other hand, the problem with pantsing is you can end up writing yourself into dead ends, following the exploits of entirely the wrong character, or wasting time wandering through a plot that you ultimately can't conclude. But friends, there is a middle way. I've seen some outlines that run to several pages, and some which almost seem like novels in themselves. Likewise I've seen simple lists that state the content of the beginning, the middle and the end. I don't have the patience for long outlines, and short lists don't quite do it for me, so I ended up with a list that simply stated what the point of each scene was going to be. For example, the first scene is set during a train robbery, so the first point was "Train robbery". Fairly self-explanatory, really. Thing is, while I knew roughly what was going to happen next, I didn't know how it was going to happen, and this is where the pantsing came into its own. Knowing what the next scene will be focusses your mind onto only those possibilities that make sense in the context of the next scene. It's liberating in the sense that you're still making it up as you go along, but it stops you wandering too far from the path since you know what your destination will be. Since then, I've read James Scott Bell's Plot & Structure and Larry Brooks' Story Engineering and both of them make an excellent case for using outlines. 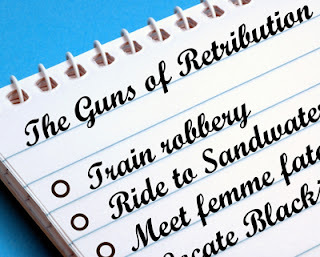 I'm certainly making another bulletpoint list while I outline the sequel to The Guns of Retribution (mostly using the 'cause and effect' train of thought - that the 'cause' scene has to come before the 'effect' scene in order to produce a logical narrative) but I'll be leaving myself enough wiggle room so I can discover the characters as I go along. The Guns of Retribution is currently available for Kindle (here for US and here for UK), and the paperback comes out on Saturday! The first two novels in my Edge of the World fantasy adventure series were definitely pantsers. The third required a very sleight outline to put together. For the fourth, which I am writing now, I used Open Office Presentation to create a story board. I think you use the tools necessary to do the job if you want to get the job done. Love your cover, by the way. Alex Young did my cover - I'm so thrilled with it! Well said Icy. I am a pantser too, and have found that it's come back to bite me in the arse. Now I find myself writing very short lists of what is to happen in each chapter, and like you, I found that most useful. Looking forward to reading Guns, I've ordered it via Amazon, and I will do a review of it on my humble blog.